We are doing a series of 2012 web design trends, and our seventh and final prediction for web design trends in 2012 is one page layouts. One page layouts are beautiful, if they're done right. When constructing a one page website, make sure you don't have too much information. One page layouts work best with small, minimalist websites. Less is more in this scenario. If you have a lot of content, you may want to consider a multi-page layout. 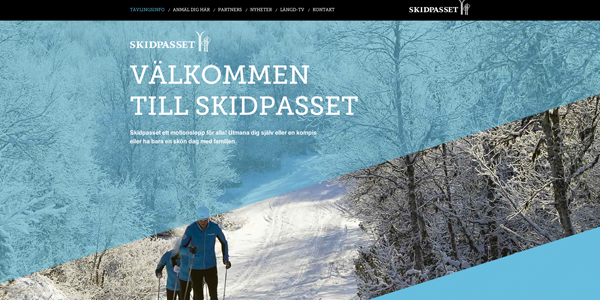 Skidpasset's website is a great example of a one page layout. I especially like how the navigation follows you throughout the site. It is important that the user doesn't lose the navigation. Skidpasset's home page screen. Visit the site for the full experience. 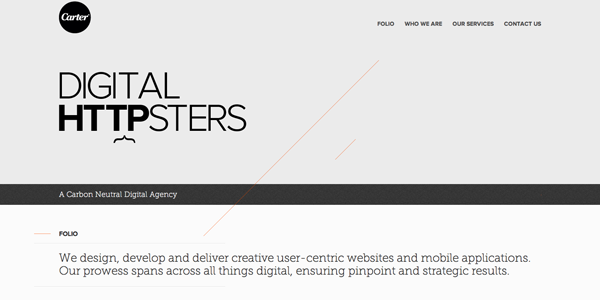 Carter Digital's website also has a navigation that follows the user down the page. The following navigation, however, is different from the "home" screen navigation. Changing the navigation shows other designers you don't have to be stuck with the same navigation on the "interior" screens. Carter Digital's home page screen. View the site for the full experience. Volkswagen Beetle's website takes a long time to load, but it is definitely worth the wait. Let the scrolling begin! 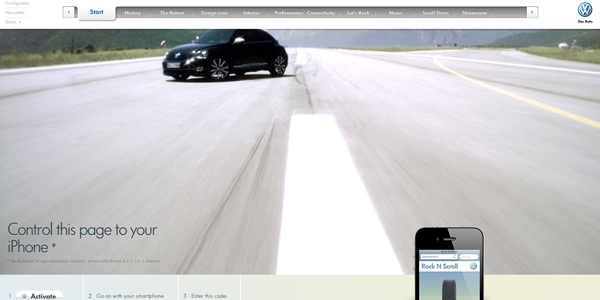 Volkswagen Beetle's home page screen. View the site for the full experience. I think it is extremely important that the navigation is accessible throughout the layout. If the user scrolls down to the bottom of the page and the navigation is missing, it confuses the user (even though all of the information is on the same page). Do you want to check out more one page web designs? One Page Love has endless pages of beautiful one page designs. I could probably spend hours on this site. They have a variety of lists, from most loved sites to sites that should be launching soon. Our web design predictions for 2011 also included one-page layouts. It is a growing trend and will continue throughout 2012. See some of our examples there. Do you want to add some of these new trends to your website? It is important to continually update your website and incorporate new trends -- your website is a 24/7 marketing tool for your business and communicates to visitors many times before they even make contact with you. Schedule a web consultation with TBH Creative. We specialize in web design and are committed to keeping up with the newest web design trends.